yay, you found the coupon! Looking for a great deal? You got it. 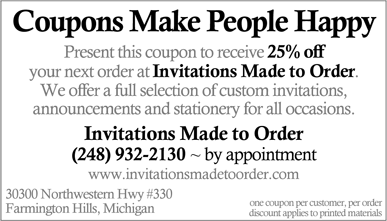 We’re offering a special online exclusive coupon good for 25% off your next order with Invitations Made to Order. All you have to do is contact us to schedule an appointment, print out this coupon, and bring it in when you meet with us so you can get 25% your entire order. We think that this coupon will make you happy. Enjoy - and contact us soon, because this is a limited time offer. Are you ready to set up an appointment with Invitations Made to Order? Then fill out our online form to schedule an appointment or call us at (248) 932-2130 to set up your appointment today!